Our music industry is flourishing with abundance of music concerts in Pakistan as international artists are coming to perform. 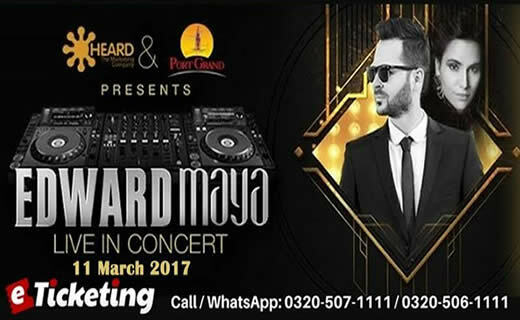 One of them Edward Maya is at the last stages of his visit to Pakistan. After amusing the music loving people of Pakistan in Lahore and Faisalabad, he will be on the heights of his art when he spellbinds masses of Karachi with soft tunes of his music on Saturday. The legendary music artist will be performing live at Port Grand Karachi on 11 March 2017 at 8:00 PM. The “Stereo Love” fame will enthrall the crowd with his sweet melodies. One of Pakistan’s leading singers Zoe Viccajji will also be performing. The comedians Faraz Ahmed and Umar Ahmed will also be the part of the event who will present a brilliant comedy show to amuse the public. This is going to be a full of entertainment night quenching the thirst of music, comedy and food lovers. It will unite tunes of music, laughter of comedy and flavors of foods under one roof. Port Grand is an entertainment providing place of Karachi where people can take relief out of their busy lives. Port Grand Food and Drink and Entertainment Complex being a center of coastal recreational activities in the city provides shopping, dining and cultural opportunities to the residents.